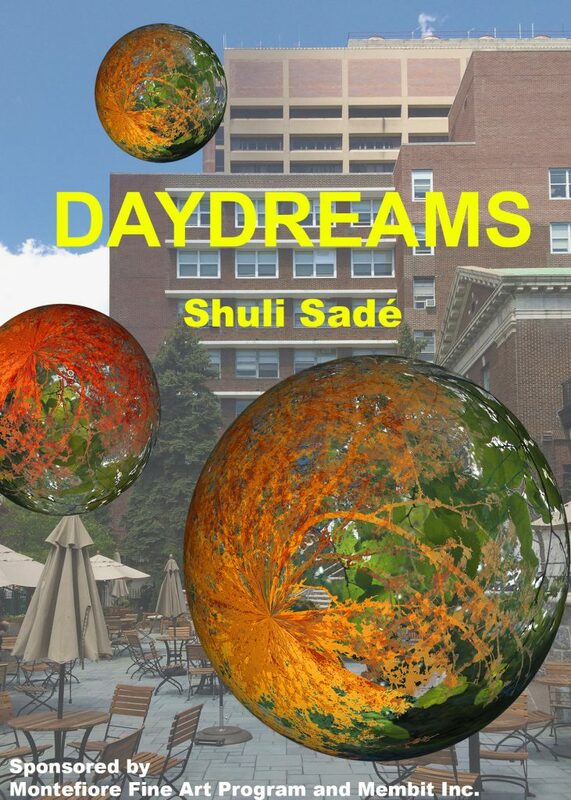 Shuli Sadé-Daydreams Augmented Reality Installation – Membit Inc. Experience cutting-edge technology that blurs the line between art and science in DAYDREAMS, an augmented reality installation opening July 7, 2017 at Montefiore Medical Center’s Gallery in the Gardens. DAYDREAMS will be on view from July 7 – October 15, 2017. The Artist’s Reception is Thursday, July 20, 2017 from 6:00-8:00pm. For more information, please visit: www.montefiore.org/artprogram. New- York-based multi-disciplinary artist Shuli Sadé (www.shulisade.com) works across a range of mediums: photography, video, drawings, sculpture installation, and augmented reality. In recent years, she created large-scale Public Art projects. Sadé has taught and lectured at the University of Pennsylvania School of Architecture, Parsons School of Design, Columbia University’s Barnard College, and Bezalel Academy of Arts and Design School of Architecture. Sadé has received the Pollock Krasner Foundation Grant, Endowment for the Arts Fellowship, New York Foundation for the Arts Emergency Grant, Lower Manhattan Cultural Council Fund Grant, NY- Israel Cultural Cooperation Commission Grant, AICF Study Grant, and NY Art Development Committee grants. Her work is in numerous private and public collections. The Collaboration of Design and Art, a global platform to showcase commissioned art, awarded Sadé’s installation at the Neurobiology of Cognition Laboratory at NYU (2010–2012) with a 2013 Top 100 award. Montefiore Health System is a premier academic health system and the University Hospital for Albert Einstein College of Medicine. Combining nationally-recognized clinical excellence with a population health perspective that focuses on the comprehensive needs of the communities it serves, Montefiore delivers coordinated, compassionate, science-driven care where, when, and how patients need it most. Montefiore consists of eleven hospitals and an extended care facility with a total of 3,236 beds, a School of Nursing, and state-of-the-art primary and specialty care provided through a network of more than 150 locations across the region, including the largest school health program in the nation and a home health program. The Children’s Hospital at Montefiore is consistently named in U.S. New & World Report’s “America’s Best Children’s Hospitals.” Montefiore’s partnership with Einstein advances clinical and translational research to accelerate the pace at which new discoveries become the treatments and therapies that benefit patients. The health system derives its inspiration for excellence from its patients and community, and continues to be on the frontlines of developing innovative approaches to care. For more information, please visit www.montefiore.org.